Macon County Chronicle is a leader in creating and implementing online advertising campaigns that attract local customers. 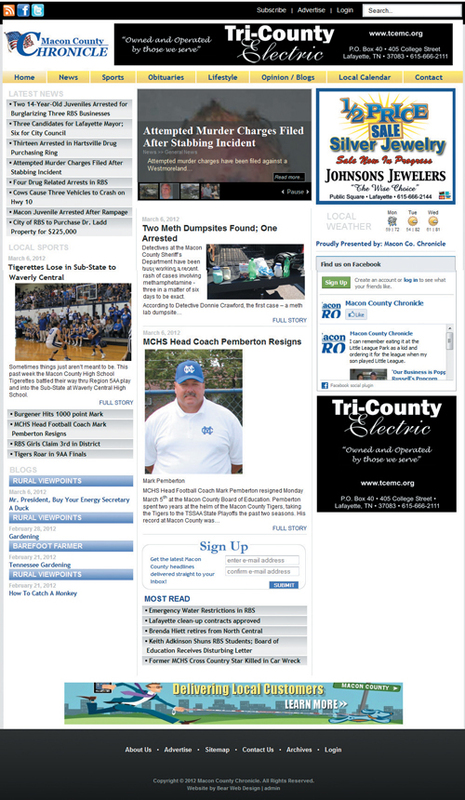 MaconCountyChronicle.com is a leader in local online news and information averaging 3,500 unique visitors, 10,000 visits, and 75,000 page views per month. MaconCountyChronicle.com updates news stories daily and includes interactive community environment where visitors can search stories and media, current events and local calendars, read and comment on blogs and opinion, interact with social media, and subscribe to news feeds and e-news. MOBILE Our Mobile website allows viewers to get real-time content from their wireless phones/devices while they’re “on the go” including breaking news, sports, business, style and more.